Fly-half Jonathan Sexton exploded on to the scene with an ice-cool cameo performance for Leinster as the Irish province beat their fierce rivals Munster in the 2009 Heineken Cup semi-final at Croke Park. A bit-part player for the province previously, Sexton stepped up following an injury to Felipe Contepomi and guided Leinster in to the final. He started at fly-half at Murrayfield in the final, kicking 11 points including an outrageous drop-goal as Leinster beat Leicester 19-16. Later in 2009 he was included in the Ireland 'A' squad for the Churchill Cup and kicked 15 points in the final as the Irish routed England Saxons in the final. Sexton began the 2009-10 season as Leinster's first-choice fly-half and was rewarded with a his first Test cap against Fiji at the RDS in November 2009. He kicked 16 points and was named Man of the Match in a 46-10 win and kept his place in the side for the visit of South Africa, displacing Munster veteran Ronan O'Gara for the first time. Injury ruled him out of contention for Ireland's opening Six Nations game in 2010, but he returned to action off the bench as they lost heavily to France in Paris. Sexton continued his international education on tour that summer, coming off the bench against the All Blacks and starting against Australia. During the 2011 Six Nations the Ireland No.10 jersey was shared between Sexton and O'Gara. Despite his rival's Man of the Match performance against Scotland and his own underwhelming display off the bench against Wales, Sexton was handed the role for the final game, a Grand Slam decider for England at Lansdowne Road. He rewarded coach Declan Kidney by steering Ireland to a Grand Slam party-crashing 24-8 victory. Sexton and O'Gara shared the No.10 jersey during the 2011 World Cup with the Leinster man starting two of their five matches - including their win over Australia. And after they crashed out in the quarter-finals, Sexton returned to Leinster in time for their Heineken Cup campaign. He kicked a last minute penalty to draw the game level with Montpellier and earned back to back man of the match awards against Bath as he kicked 18 points in their win at The Rec before pulling the strings masterfully at the Aviva as the Heineken Cup champions dispatched the West Country side with ease. 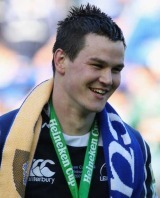 Sexton would also play a key role in Leinster's second Heineken Cup triumph over Northampton later in the year. The Irish province looked well-beaten at half-time with an impressive showing from the Saints powering them into a 22-6 lead. But Sexton inspired a second half comeback with two tries on his way to a 28-point haul that propelled his side to an amazing 33-22 victory. Sexton lost the Ireland No.10 shirt for the World Cup as he endured a disappointing campaign but usurped O'Gara for the 2012 Six Nations - though the tournament ended disappointingly for Ireland. He began the 2013 Six Nations well but injury ended his championship early but his disappointment was tempered by a lucrative deal with Top 14 side Racing Metro that would see him move to France ahead of the 2013-14 season. He eventually overcame his injury concerns and was named in the British & Irish Lions squad before helping Leinster to a PRO12 and Amlin Challenge Cup double. Sexton played a central for the Lions in Australia as he started all three Tests against the Wallabies, scoring a try in the final decisive Test in Sydney, as the Lions won the series 2-1.